Keyword research is a practice used to find and research search terms that people enter into search engines while looking for a similar subject. These keywords are needed to help a website rank on search engines. Alongside this, there is relevant content and backlinks needed. What keywords you find, depends on your goals and objectives, your budget, resources, industry and competition. Whatever your industry is, you need good keywords to make your website rank and gain the organic traffic that you want. Think of some keywords that you would potentially search to find your business. It’s easy to come up with keywords if you already have a business that you want to promote online. I would recommend thinking about how other people might search for your business. If you don’t know who your competitors are, then search for them using the keywords you thought about at the beginning of the process. Take a look at who’s on the first page and write their domains down so that you can check what keywords they are ranking for. There are a lot of keyword research tools out there which will show you what your competitors are using. I would recommend noting down all the keywords that you find, and if they show any other statistics (like volume, keyword difficulty etc.) then write that down too. Do this process for as many of the competitors as you want, but I would only focus on the top 5 on the first page as it’s clear that they are working on getting to the top spot. Make sure you do this for every keyword you thought of. Checking through the competitors on your chosen keywords will definitely help you a lot, however you need to find your own unique keywords that your competitors aren’t targeting. These tools are good at showing you alternative keywords to the ones you type in, some with the volume, CPC and competition. If you need something more advanced, then check out SEMrush, Moz and Ahrefs. 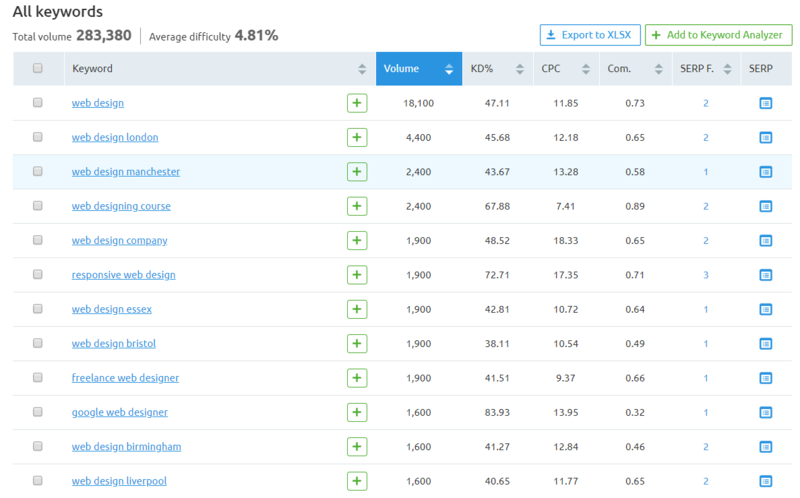 They show a lot more information regarding the keywords, and give you related keywords with higher or lower volume and other levels. For example, SEMrush gives you a full huge list of keyword ideas for “web design”. There is a lot more information shown on SEMrush compared to the free keyword research tools listed above. You get the volume, keyword difficulty, cost per click, competitive density and SERP features. It is worth using if you want to get serious with your keyword research. Search volume shows the overall search demand of a given keyword. It shows you how many times around the world or in a specific country put this keyword into Google search. Search volume does have a problem, it can’t accurately predict the search traffic that you will receive from the given keyword. It’s still worth considering however. It might be worth finding out the trends of that keyword with Google Trends. It can show you the keywords interest over time, which is good to know as your keyword might be popular at one time at the year but unpopular at another time. The keyword difficulty is a very good metric to look at. If a keyword you are looking at has a very low difficulty, low competitiveness and high volume, you would pick that keyword, right? It shows that no one is fighting for that keyword, but people are searching for it. It’s definitely worth driving those people to your website. Competitive density is important as it shows how competitive your keyword is. You will have major difficulty ranking for a keyword that is 100% competitive compared to one that is only 10% competitive. Once you have figured out which keywords you are going to use, you will want to apply them to your web pages and/or blog posts! I would recommend applying these keywords to your content too, to help your page rank even higher! If you need help with your keyword research or want us to do it for you, please get in touch! We are here to help. Also, if you need a full website analysis (including SEO) then click the link below and use our free web test!